Everybody deserves a good home. Dog adoption is a process that entails acquiring custody of a dog and taking responsibility for the animal that was abandoned by a former owner or surrendered to an animal shelter or a rescue organization. 1. Prior to taking in a dog, an applicant will need to visit nearby pet shelters and inform the management of his or her intention to adopt a dog. 2. Once a dog is selected, an application requesting for the adoption of the dog will be submitted. 3. When the animal shelter management accepts the request, a staff will then be assigned to visit the applicant’s residence to make sure that it is comfortable and favorable for the pet. Home visits greatly vary from one shelter to another. 4. A background check and character interview are then conducted to further assess the applicant’s capability to care for the pet. 5. After the application is approved, the applicant is then required to fill out forms and pay the adoption fee. The new owner can then bring the dog home. Note: There are some instances that the background check and interview comes first—before the home visit. Adoption fees are a necessary expense when obtaining a dog from an animal shelter. When a dog is sent to the pet shelter, its basic needs are provided by the shelter until the animal finds a new home. Shelters and rescue groups often cover initial veterinary expenses while it is being set up for adoption. Routine expenses in animal shelters include food and shelter, vaccinations, spaying and neutering, veterinary health visits and exams, deworming, heartworm tests, parasite treatments, microchips, collar and an identification tag, treats, toys, and other necessities. Adoption fees go towards the cost of care an adopted dog has received while staying at the shelter. It is typical to base the adoption fee on the age of the dog being adopted. Depending on the type of organization, adopting a dog may cost none or it can be several hundred dollars. In many shelters, the adoption fee ranges from $250 to $450. Pet shelters and rescue organizations usually offer reduced adoption fees to individuals who adopt an adult or senior pet. These groups also hold special events wherein adoption fees are waived. 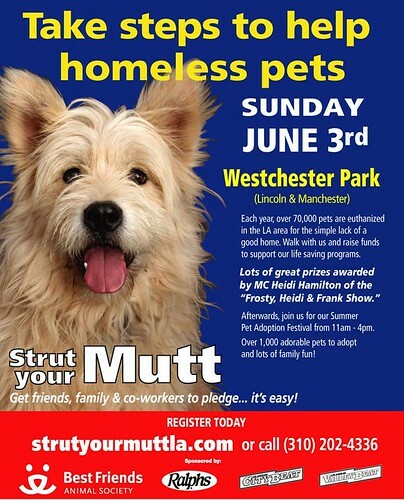 Just one of the many events we can all support to find homes for pets that deserve them. Adoptable pets are typically found in thousands of animal shelters and rescue groups all over the United States. Interested individuals can personally visit these centers to find a potential pet. Adequate time should be spent in choosing a dog. The ideal time is during the middle of the week when shelters are usually less crowded. When possible, repeated visits must be made to the shelter to observe for variations in the behavior of a potential pet. Pet shelters and rescue organizations also offer online pet adoption. They maintain databases of animals currently housed in various shelters and rescue groups in different parts of the country. Among the most commonly used sites are Petfinder.org, Adopt-a-Pet.com, and TheShelterPetProject.org. Stephanie is a freelance writer who resides in Gilbert, Arizona. In her free time, she enjoys spending time outdoors, hiking and with her family. This is a really good post. I have wondered myself on how to go about adopting pets so this should be an awesome experience. Very nice post! It will make dog adoption much more easier. Thanks for the information!!!! !